Speaking of help desk actions, FMChat is a perfect add-on for help desk systems built using FileMaker, an approach common with smaller business and many schools. 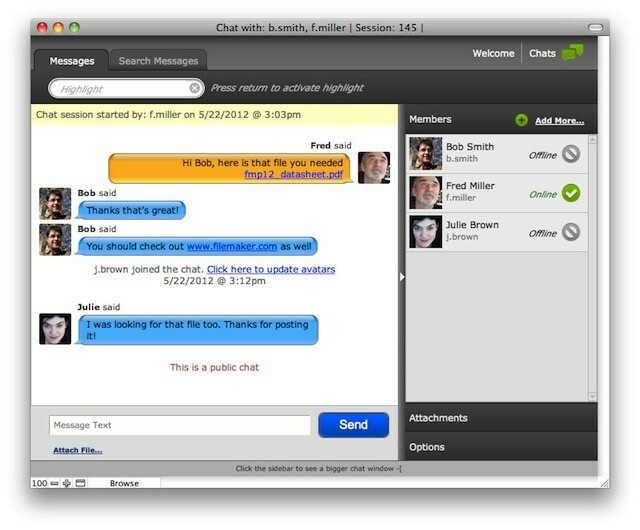 The chat functionality can be used along with other technologies to interact with users that are having problems in real-time. Such real-time chats actually offer advantages over traditional phone-based support – one reason being that using chat as a medium allows help desk staff to handle multiple non-priority issues at the same time. In addition to chat, FMChat includes alerts and notifications. FMChat can also handle attachments and it offers a secure and searchable chat history (also a great feature help desks and many other FileMaker solutions). FMChat isn’t SeedCode’s first impressive FileMaker add-on. The company offers a range of polished FileMaker templates that can easily be modified as needed by a business or individual FileMaker developer to create a new solution. Like FMChat, several can also be integrated into existing FileMaker solutions. FMChat is available for $329 from the company’s website.